Life in the Pitts: This is going to make conversations so much easier. I love that! You should totally do that at doctor's appts, too...So tell me, where does it hurt? "lifeinthepitts.com" how long have you been feeling ill? 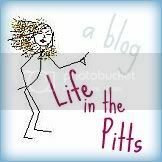 "lifeinthepitts.com"